Click to edit the layout and find Social Share in the left-hand pane. Drag and drop into the layout. To edit the content block, hover over the block and click. The Social Share block will open for editing in the left-hand pane. Go to the Content tab. 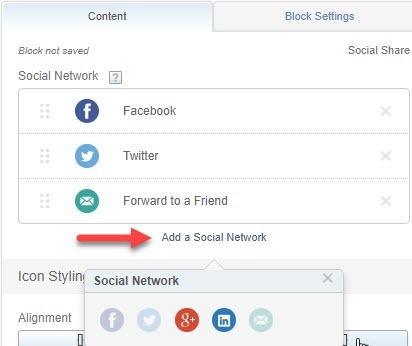 To add social share icons, click Add a Social Network and select from the list of available networks. Click the X to remove social networks. 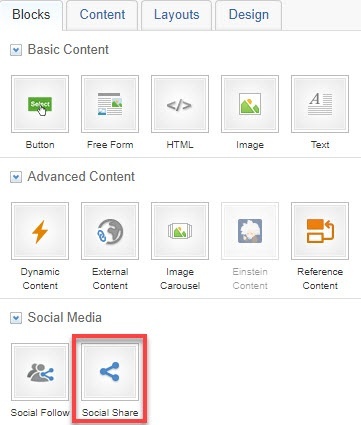 Select the alignment of the social share icons: Left, Center, or Right. Select the layout of the social share icons: Horizontal or Vertical. Select an icon style from the drop-down menu. If you want text labels with the social media icons, check the box for include text label with icon. Adjust the font and text color if desired.